A favourite passing sequence of mine devised by Premier League's Technical Skill Instructor Alfred Galustian. It involves short & long passing, but it incorporates the ever dangerous wall pass. Encourages players to get their head up and to play forward, get forward. Once the players have learned the sequence and over come the learning curve, the goal is to play as many passes on their first touch. 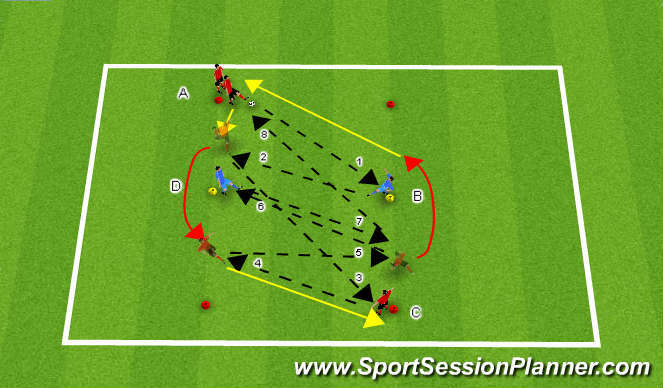 Opening body to receive the ball, Quality of the pass to support player without a bounce, play the pass then accelerate forward, play to the appropriate foot (safe side passing).